I had been looking for costume ideas for my 10 month old son, Caeleb, when I came home from work to find my husband playing The original Willy Wonka and the Chocolate Factory, and my little man bopping to the music and loving it. 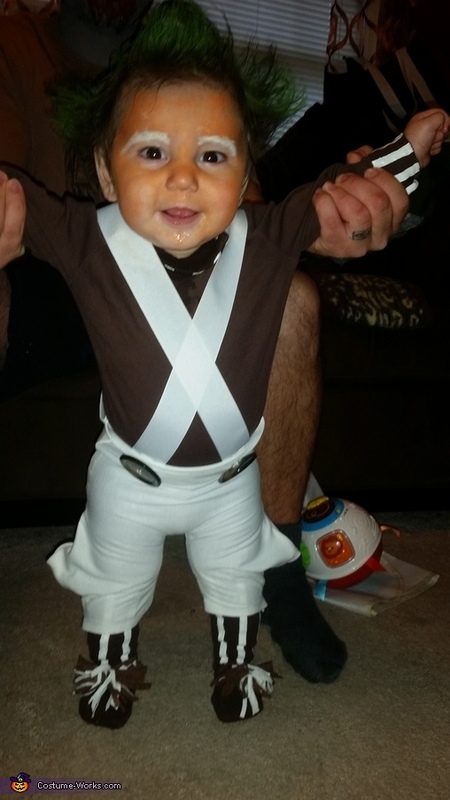 So I went online searching for a baby oompa loompa costume which is almost non existant and what I did find was very pricey and looked cheap. I decided to give it a go on my own. I ordered brown tights and a turtleneck off of Amazon. I used white puff paint for the stripes on the tights, cuffs, and collar. I made the pants out of a white cotton t-shirt like material, and used Heat Bond ultrabond iron on stitching (which held up amazingly). I used a thick white ribbon for the suspenders which I velcroed to the pants for easy diaper changing. Large brown buttons that I had sewn to the front of the pants. Finally, I used some brown and white felt scraps I had to make the pom poms that I attatched to his feet with velcro as well. His hair was styled using hair glue and green hair spray paint and I used orange and white face paint for his face. I paid a total of about $22.00 for all the supplies and it took me about 4 hours total to make the costume.